The Department of Public Works Building Division announces new hours for processing permit applications at the front desks of Hilo and Kona offices effective October 1. This change only affects applications requiring front desk clerical assistance. The new hours will be 7:45 AM to 3:30 PM Monday – Friday, except Wednesday (Hilo) and Thursday (Kona). The office remains available to service code questions, plan review consultation, drop-off of plans and pick-up of plans/permits. This recent change will allow the permit staff uninterrupted time for processing permit applications. For applicant convenience, permit applications may be submitted online at anytime 24-hrs/7-days through the County web site at http://papaaukahi.hawaiicounty.gov. Public computers within the Hilo and Kona Building Division Offices are also available to create online permit applications. Kaiwiki Bridge Slated for Repair… South Hilo Residents in Area be PREPARED! 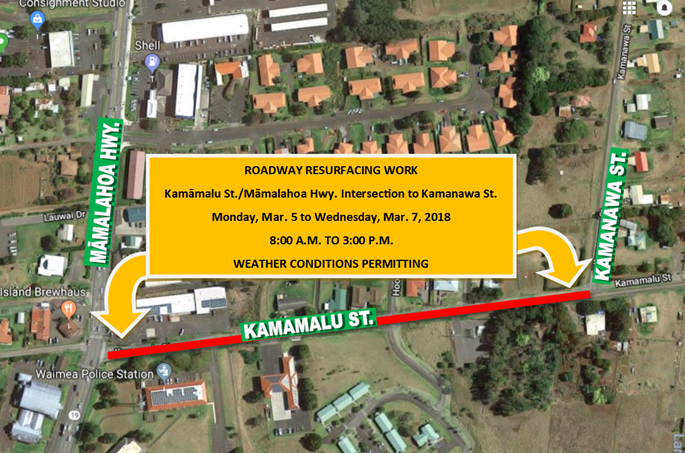 The Department of Public Works is scheduled to replace wooden planks, stringers and resurface 50 feet of roadway on upper Kaiwiki Homestead Bridge in South Hilo. Bridge repairs will be conducted weekdays between the hours of 8:30 a.m. to 3:30 p.m. from Wednesday, September 15 to Monday, October 4. Pedestrians, however, may use the bridge between noon and 1 p.m. The bridge will reopen to all vehicles and pedestrians after 3:30 p.m. and remain open weekends and holidays. Jas W. Glover, Ltd., contractor for the $152,000 project, began work on September 13. Completion is scheduled by the third week of October, weather permitting. Among the future/in planning projects are Traffic Controls for the district that would be ADA Compliant. My question is… when they say “future“ does this mean any time soon… or does this mean in 20 – 30 years… or possibly not at all?